MM's Kitchen Bites: Stir Fried Chicken in Chilli Bean Sauce...not just chocolate!! 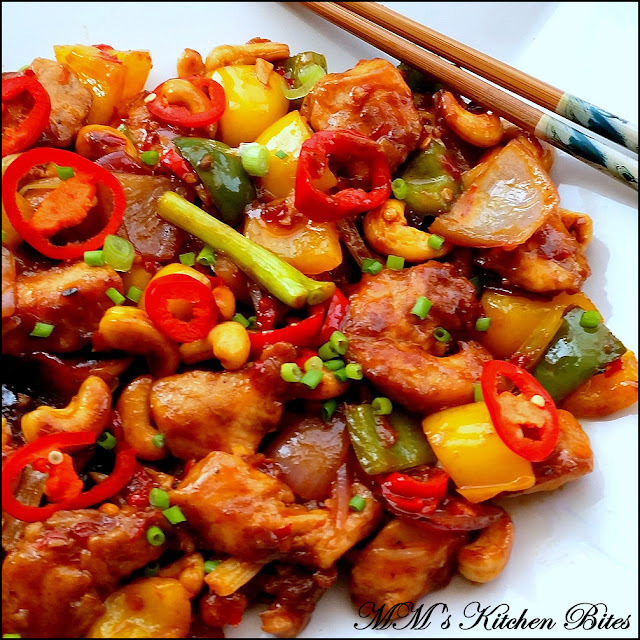 Stir Fried Chicken in Chilli Bean Sauce…You know what?!! Some recipes are magical. They just know what your soul needs and hit the spot – whether you are feeling down and out or feeling on top of the world. Abracadabra!! and it is taken care of at the first bite (and all this while you thought only chocolate had that magical power!! tch tch!! J)…adapted from one of Jeremy Pang’s recipes, hope you enjoy it as much as we do! Marinate the chicken with sugar, Chinese 5 spice powder, sesame oil, light soy sauce in a medium size bowl. Sprinkle with corn starch, toss to coat well and leave to marinade in the refrigerator for about half an hour to overnight. Get the chicken back to room temperature before cooking. Mix the sauce ingredients in a small bowl and keep aside. Swirl in 1 tbsp oil and heat it till the oil starts to shimmer. Add the remaining 1 tbsp oil to the wok. Add in the red chillies and garlic and stir fry for about 10 seconds. Add the onions and stir fry for another 30 seconds or so. Add the peppers and the long cut scallions. Stir fry for a couple of minutes. All vegetables should still retain some crunch. 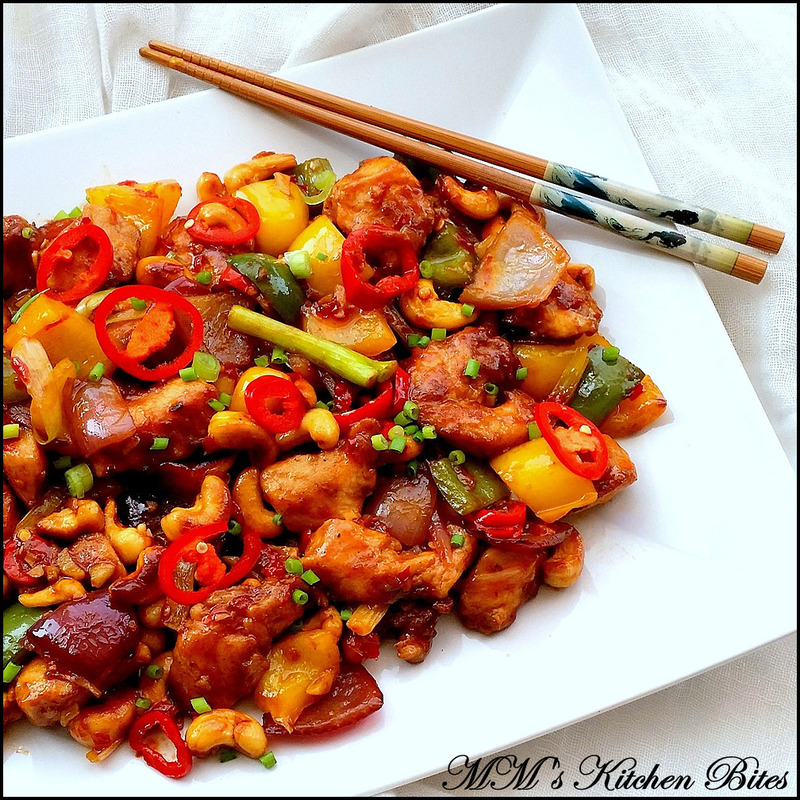 Add the chicken back into the wok with cashews, finely chopped green onions, crushed pepper and the sauce mix. Stir fry for another minute or two till everything is coated well with sauce. Taste and adjust seasoning. Top with the reserved spring onions and chillies. Serve hot. Chilli Bean Paste is also known as “Toban Djan”. I use the Lee Kum Kee brand which is a little more garlicky than a couple of other brands that I have tried. A really good and must have addition for your kitchen if you cook Chinese often. If you don’t, you can try substituting with Sambal Oelek or any other Asian Chilli sauce. You can replace sugar with honey. Add honey right at final stage of tossing.